My seven year old golden retriever, Yukon Jac, had to have surgery this week at our vet clinic here in Pickering Ontario to repair a ruptured cruciate ligament. I thought it would be a good time to explain the injury and to talk about the surgical procedure Yukon Jac had to repair the knee. The word cruciate means “to cross over” or “form a cross.” The cruciate ligaments are two bands of fibrous tissue located within each knee joint. They join the femur and tibia (the bones above and below the knee joint) together so that the knee works as a hinged joint. One of the important functions of the cruciate ligament is to prevent forward and backward sliding of the femur on the tibia bone. In dogs, the most common knee injury is a rupture of the cranial cruciate ligament. Acute or traumatic cruciate rupture is caused by a twisting injury to the knee joint. This occurs most often when the dog (or athlete) is running and suddenly changes direction. This places the majority of the body weight on the knee joint, and excessive rotational and shearing forces are placed on the cruciate ligaments. A cruciate ligament rupture is usually extremely painful and the knee joint becomes unstable, resulting in lameness. 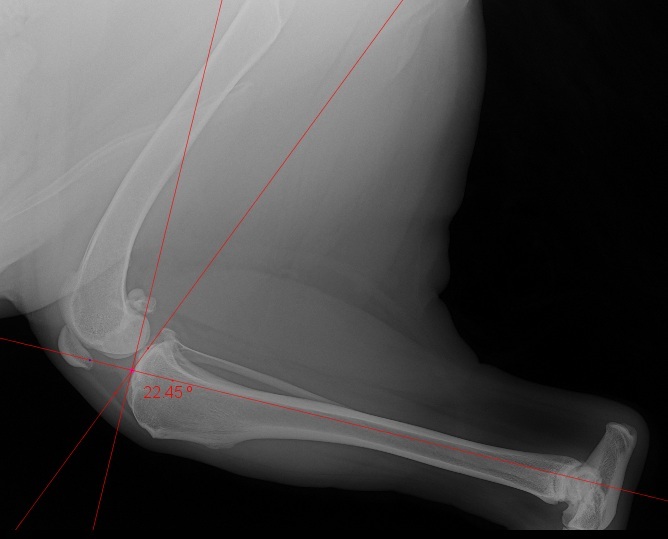 Obese dogs appear to be more predisposed to developing a cruciate rupture. In these dogs, the injury may occur with minor trauma to the knee, such as stumbling over a rock while walking. 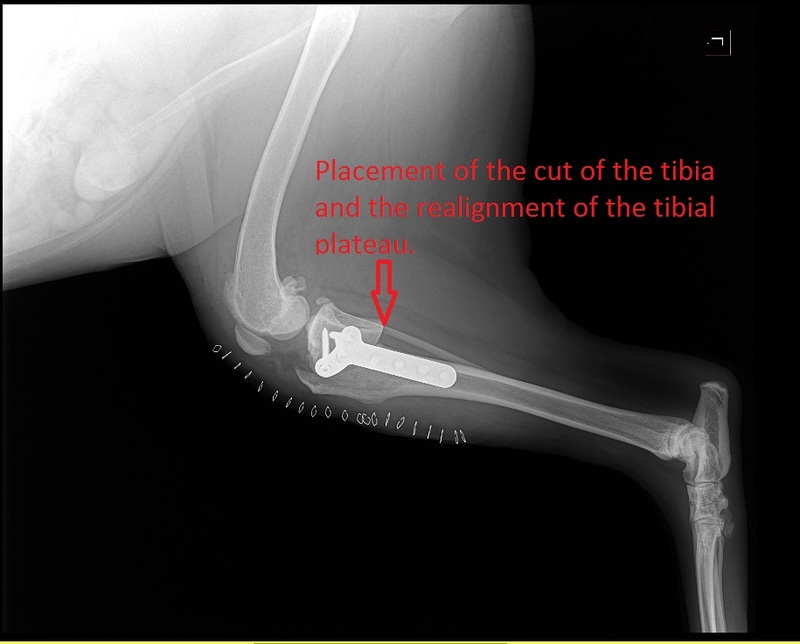 There are various surgical techniques performed to stabilize the knee joint following cruciate rupture, but Dr. Wood used a relatively new technique called a TPLO procedure (Tibial plateau leveling osteotomy). In this procedure the tibial plateau, the portion of the adjoining the stifle, is cut and rotated (see x-ray below) so that its slope changes to approximately 5 degrees from the horizontal plane. This prevents the femur from sliding down the slope of the tibial plateau when the dog puts weight on its knee. A bone plate and screws are used to hold the repositioned tibial plateau in position until it heals (this usually takes 8-12 weeks). The plate and screws are usually permanent. There are photos of the actual surgery on our facebook page at www.facebook.com/AmberleaAH. Hear I talked about the TPLO procedures, but there are a number of options to handle cruciate ligament injuries, so, as always talk to your veterinarian about the best treatment for your pet.